Announcing the winners of the 39th ever Right Place Photo Caption Contest! Presenting the top 20 captions for this picture from REUTERS/Joshua Roberts via Yahoo! #20: Staring at Cynthia McKinney's posterior, Danny Glover contemplates breaking down to the "Too Much Booty in the Pants" Dance. #19: Actor Danny Glover takes a step back as a microphone electrical short causes Rep. McKinney's hair to stand on end... and also makes her speech briefly make some sort of sense. #18: Glover: "I thought this was a convention for the Association of Retired Socialist Entertainers (A.R.S.E.)!" #17: Harry Belafonte's new job... Goose McKinney every time she says "racist." The goosing of Glover was just a freebie. #16: Cynthia's two Pips shy of a band. #15: The Moonbats have implemented a very effective affirmative action program. #14: Danny Glover contemplates the location that Rep. McKinney has decided to display her Congressional admittance pin. #13: McKinney: "...And so I call for the complete eradication of all white, racist, police officer pigs!" Glover: "What did she just say???" Belafonte: "She said that false Jews run the Bush Administration, now shut up drink your Kool-Aid." #12: The weirdest thing of all at the press conference was not all the calls of "racism" (which were expected), but that Harry Belafonte showed up with a second head attached to his right shoulder. #11: This is what Condi would look like if she smoked pot, took acid, chugged Night Train and par-tayed with Whitney Houston! #10: "Cynthia! Don't touch the mic! It's not... (pzzzat)... grounded! Dang, there goes her hair." #9: McKinney announces she is taking two experts with her on an up-coming fact-finding trip to Cuba and Venezuela courtesy of the American taxpayer. #8: Harry and Danny were not prepared for Cynthia's combination Chipmunk/Smurfette-sounding rendition of "R-E-S-P-E-C-T". #7: It was a natural mistake. With Glover as the Scarecrow and Belafonte as the Tin Woodsman, they naturally assumed that McKinney, with her new 'do, was auditioning for the role of the Wicked Witch of the South in the all Moonbat version of The Wiz. #6: Danny Glover stands amazed as he watches Harry Belafonte's hair migrate to Cynthia McKinney's head. #5: Danny Glover has second thoughts about Lethal Weapon 5 after seeing how badly Chris Rock's surgery went. Daylight come and mi Prozac gone. #3: "...And furthermore, so this never happens again, I demand a separate 'Blacks Only' entrance to Congress." #2: "I am NOT a violent woman! And the first person to say I am is going to get cut long, deep and often!" 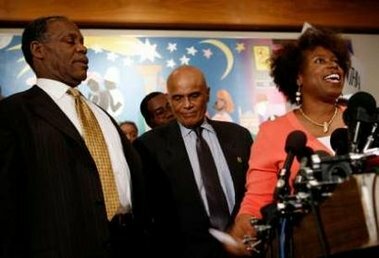 #1: Cynthia McKinney holds a press conference to blame her new hairdo on the J-E-W-S.
McKinney: "When shall we three meet again?" Glover: "In thunder, lightning, or in rain? When the recount's lost and lost." Belafonte: "That will be ere the set of sun." Belafonte: "There to meet with Mikey Moore." McKinney: "I come, Hag Hillary!" Doubly so Ward Churchill's hair." The above entry has been claimed in the comments section and is now attributed to the proper author (we hope)!